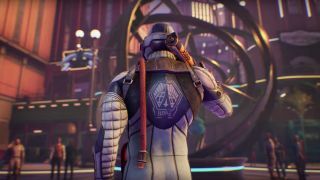 Some more big-name games have been announced as exclusives for the Epic Games Store, including The Outer Worlds from Obsidian Entertainment – with a slight caveat, more on that later – and Control developed by Remedy Entertainment. Epic announced these exclusives – and many more – during its GDC 2019 keynote, and they follow other major victories for the store such as snatching The Division 2 and Metro Exodus away from the likes of Steam. Indeed, Epic announced an extension to its agreement with Ubisoft, the publisher of the former, to “bring several major PC releases to the store in partnership with their Uplay division”. The exact games in question weren’t revealed, but Ubisoft will provide details down the line. The new titles which were announced as Epic Games Store exclusives were numerous, though, with some impressively high-profile outings. As mentioned, they include Control, a supernatural action-adventure developed by Remedy with the publisher being 505 Games, and The Outer Worlds, a sci-fi RPG developed by Obsidian and published by Private Division (a subsidiary of Take-Two). Another exclusive published by the latter is Ancestors: The Humankind Odyssey from Panache Digital Games, an open world survival game following the evolution of the human race, from the creator of Assassin’s Creed. It’s worth noting that The Outer Worlds won’t be a strict exclusive, though, as it will also be available on the Microsoft Store too (but not elsewhere). Finally, another point scored for Epic is the fact that Quantic Dream will be bringing PC versions of its big hits Heavy Rain, Beyond: Two Souls, and Detroit: Become Human, to the store. Epic is certainly building up considerable momentum in its bid to challenge rival digital platforms like Steam, helped along not just by these sort of deals, but also the quality freebies which have been given away since the store launched. The company further revealed that Metro: Exodus sold 2.5 times more copies in its first few weeks on the Epic Games Store, than its predecessor, Metro: Last Light, managed to sell on Steam in the same time period after its launch.